If only I knew about this place or thought about yesterday. 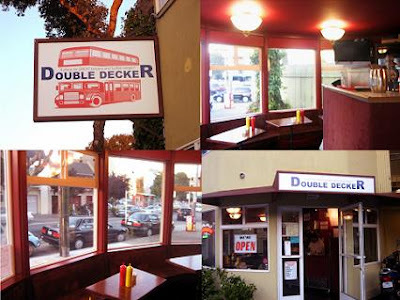 After lots of research, the second place I chose was the Double Decker in SF. Albeit, it's located in a shady area as most people commented on the internet. The interior seems pretty clean where they prepare the food and the funny thing was everyone there was Asian, I think they spoke Cantonese. Everyone there was friendly. I just wish that we went on Wednesday night when it's all you can eat wings night for $11.95! Yum Yum! Of course we had to try it out ourselves to see if we liked it and then come back I guess. The dining area or waiting area by the kitchen was tiny. I didn't walk upstairs to go to their "dining" area. I ordered the Garlic Fries because I am a devout garlic lover! When I got in the car, I took them out immediately and they were so fragrant. Sadly, the fries were kind of soggy so they weren't that good and they lacked flavor. I know the pictures looks somewhat good, but to be honest I did a lot of color touch ups because it looked too bland. What really surprised me was that the Buffalo Wings were pretty good. They were much better than I thought they would be. Ms. Lin and I love good buffalo wings, but there seems to be a limited supply up in SF! The prices were reasonable and they were tasty. Their sizes were a little small, but it's still a better deal than Little Star Pizza. The buffalo sauce was tasty but a little bit on the sweeter side and not too spicy. Unfortunately I don't like things too spicy and Ms. Lin loves it hot! So we always do mild with hot sauce on the side for her. On the internet I read that they offer Inferno and I asked in Ms. Lin would like that but she actually declined! BOO! Maybe if she goes back by herself she can try the Inferno, if she dares! All in all I was satisfied with this place. The food was good and the prices were decent. They are on my list of places I might eat next Wednesday! Although once we go there for all you can eat wings, I am sure our pictures will be up on the "black listed" wall. O=P I kept looking at the fresh burgers they were making and they also looked good. They use a special ranch for their meat. I just might order take out and have them deliver to the apt. Yum Yum!